The new Bato Chef is proud to introduce his new products to you. What makes Bato Chips special is the species, quality and freshness of potatoes used as well as other ingredients employed in the production process (ex. usage of the most appropriate vegetable oils for frying purposes). The product is preservative free and is produced and packed with the latest European technological machineries. 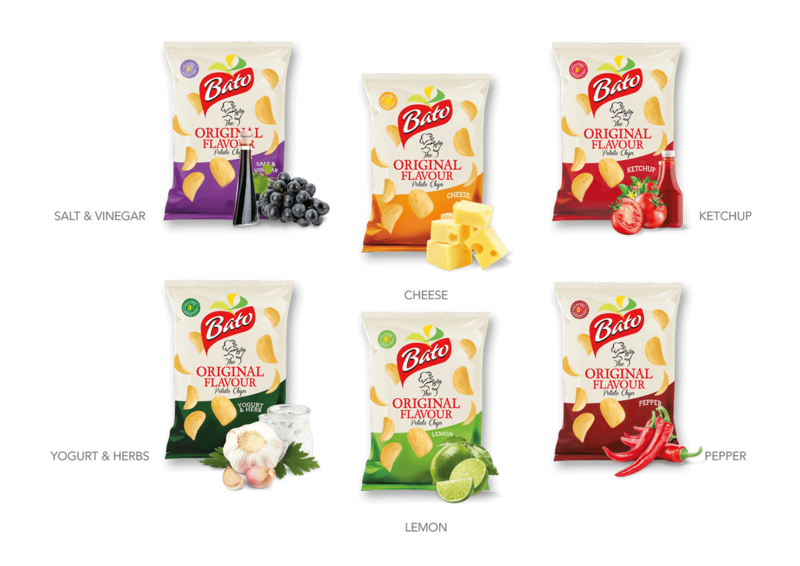 The “Original” Bato range comes in various delicious flavours such as, Lightly salted, Salt & Vinegar, Cheese, Lemon, Ketchup, Pepper, Yogurt and Herbs, etc. Get familiar with the Authentic taste of potato with Bato’s potato sticks and X-Cut Chips! These potato sticks are in a variety of flavours such as, Lightly salted, Salt & Vinegar, Lemon and Bato Super Chips (X-Cut) with an authentic potato taste. Discover the NEW flavours and the mysterious secrets of Bato Chef! Chips with a roasted chicken, onion & thyme flavour. A subtle and delicous crispy taste! An exclusivity of the chef! Chips with a French cheese flavour prepared with a secret recipe of the chef. A real treat for cheese lovers!